Providing a world-class pet salon experience accessible to anyone. Whether your pet needs dog beauty services or you would like to indulge in our Päsh atmosphere, our team of specialists is here for you. Päsh strives to provide consistent fresh pet trims & ideas by keeping up with the latest trends in pet styling. We pay close attention to the details of our services to exceed your expectation. Experience South Florida's premiere Pet Salon & Boudoir. With mesmerizing hair & beauty services for your dog. We take pride in projecting our passion for dog beauty. Striving for a new approach to pet grooming, we specialize in indulging your pet with a true Pet Salon & Spa experience. Sit and chat or read a book while your dog gets their hair styled and coat enhanced by premium pet care products designed to enhance vitality and a healthy coat. Our facility is designed to give both the pet and pet owner an unforgettable experience. Don't be surprised when you find yourself sitting next to one of south Florida's many celebrities who place their trust in Päsh to care for their precious pets. Our customers are greeted with refreshments while a free consultation is made before any service starts. Customers are given valuable pet styling advice and the right options for your dog's hair style. Päsh Master Certified Dog Groomers can help determine the proper shampoo's, conditioners and hair treatments needed to restore your dog's coat to its full beauty and health. We take pride in projecting our passion for dog beauty. Striving for a new approach to pet grooming, we specialize in indulging your pet with a true Pet Salon & Spa experience. Sit and chat or read a book while your dog gets their hair styled and coat enhanced by premium pet care products designed to enhance vitality and a healthy coat. "Pina" has devoted her entire career to the grooming industry. Without question, she has achieved the highest level of pet grooming proficiency possible. Pina is a National Certified Master Groomer (NCMG) and Certifier with the National Dog Groomers Association of America. She is dedicated to providing her industry and pet owners the highest possible standards in pet care and grooming services. At Pash we take our pets safety and health very seriously. Our entire staff is trained and tested before any member of our team is permitted to handle your pet. Our team is educated over 600 hours in pet grooming, pet safety and coat recognition at nationally certified pet grooming schools, including the Merryfield School of Pet Grooming in Fort Lauderdale, Fl. Our Pash Master Stylists ensure all proper safety and correct handling procedures are being followed at all times. Päsh has developed an Open Styling Room for our client's pets to receive the highest professional standards possible. Our open design ensures your pet never feels trapped and uncomfortable. Our grooming area uses a 360-degree view maximizing exposure of your pet's appearance, creating the optimal space for our Pet Stylists to perform their best. At our Päsh Lounge clients, locals & dog lovers can socialize, ask questions and be part of the entire process. We also have a private viewing room for consultations and private lessons for the inspiring groomer or pet owner looking to gain more knowledge. National Dog Groomers Association Of America has the strictest guidelines for certification in the United States. The process is both challenging and comprehensive, covering all breed standards, anatomy, structure, pesticides and chemical precautions. 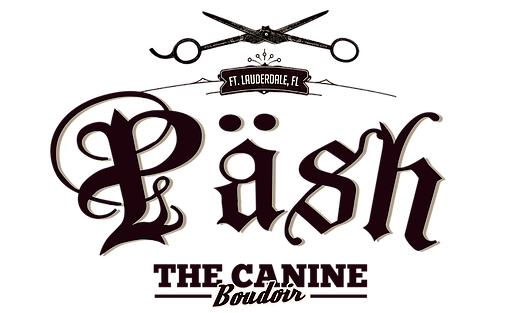 Päsh always has Master Certified Pet Stylists from the NDGAA on the premises at all times, guaranteeing your pet is receiving the best of the best. Visit www.ndgaa.com to find a Certified Master Stylist in your area. Our experts have traveled the globe connecting & collaborating with the best in the pet industry to find the top performing pet grooming products possible. Identifying the proper cosmetic products to use on different coats and skin types make a huge difference on your pets final look. We incorporate processes to promote optimum vitality and well being of your dog's hair and skin. We use very mild vitamin complex pet shampoo's for sensitive skins or frequent bathing. We offer Keratin Treatments, Protein Treatments, and facial treatments. Päsh has created the perfect setting for hosting educational seminars, world-class demonstrations, and exhibitions. Our Lounge can accommodate large audiences comfortably and with Päsh. Our vast network of World Class pet stylists, AKC breeders, national organizations, pet product suppliers, and pet industry experts make Päsh the goto place for pet industry gatherings. Call us anytime for upcoming event schedules, seminars or to book your own industry event.